EAST RUTHERFORD, N.J. (AP) — Coach Jeff Monken and the Army football team watched the New York Giants practice and were saluted by the NFL players after the workout. 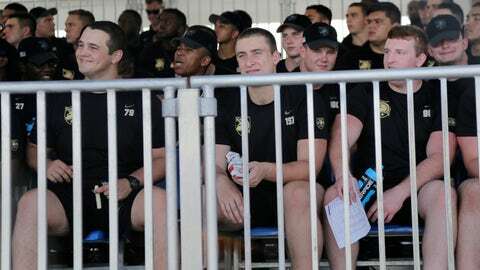 Because of NCAA rules, the Cadets had to watch the roughly two-hour workout sitting in the temporary stands surrounding the Giants’ three fields at the team headquarters near MetLife Stadium. After meeting with coach Pat Shurmur, the Giants walked over as a group, waved to the Army players and threw small equipment to the Cadets. Star receiver Odell Beckham Jr. ran toward the chain link fence separating the field from the stands and climbed it, while two-time Super Bowl MVP Eli Manning tossed gloves into the stands. “These guys are terrific young men and at some point they may be defending our freedom, so our guys, I thought it was great, they went over there and acknowledged them,” Shurmur said. Monken said the Cadets had planned to attend a practice last season but they had to cancel the trip when weather forced him to make up a practice at West Point. With a day off Tuesday, Monken planned the roughly one-hour trip from the military academy. “We were thrilled to have this opportunity to come here on our day off and watch the professionals,” Monken said. Army is coming off a 10-3 season that ended with a 42-35 win over San Diego State in the Lockheed Martin Armed Services Bowl in Texas. The Cadets open their season on Aug. 31 at Duke. Like most coaches, Monken said his team is not ready. Monken and his staff stood on the sidelines and occasionally talked to Giants coaches during the workout. Being a former special teams coach, he spoke with assistant Tom Quinn. He also liked a few of the passing routes New York was running. “We’re not a big throwing team, but we can use some of that,” he said. If one drill caught Monken’s eye it was a scout team drill the Giants were using to prepare their defense for Cleveland. Monken took note of the offensive personnel on the field.